Aaron McEneff celebrates after his cheeky 'Panenka' penalty puts Derry City 3-0 ahead against Bray at Brandywell. 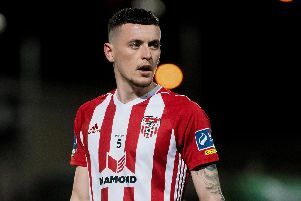 AARON McENEFF described how the vociferous Brandywell roar has inspired Derry City to two five-star showings as Kenny Shiels’ troops turned on the style on their long awaited return home to Brandywell Stadium last week. Shiels stressed the importance of entertaining the supporters who have been bereft of senior football at the venue for the past 18 months and his players have certainly delivered with 10 goals in the space of five days in wins over Limerick and then Bray Wanderers on Friday night - a third league win which saw them rise to fifth place! Friday night’s victory with 10 men was particularly impressive with McEneff’s cheeky Panenka-style penalty kick on 63 minutes putting the seal on a display which was rich in attacking flair and more importantly, self-belief. The game was still in the balance at the hour mark after goals from Rory Patterson and Ronan Curtis with Derry down to 10 men when Nicky Low was harshly handed his marching orders for a foul on Darragh Noone 35 yards from the home goal. However, when substitute, Ben Doherty’s superb run was brought to a halt inside the penalty area with 62 minutes on the clock, referee, Damien MacGraith pointed to the spot. Up stepped the prolific McEneff who attempted the audacious from the spotkick with a dinked shot down the middle to put the game beyond the struggling Seagulls. The in-form Ronan Hale, who missed a sitter from two yards in the first half, continued his goalscoring heroics with his fifth in three games on 78 minutes as Derry picked Bray apart almost at will on the counter attack. And then on came Scottish forward, David Hopkirk to put the gloss on the game, scoring less than two minutes after coming off the bench for a debut goal and City’s fifth. Shiels says he wants to wipe the recent 6-1 defeat to Shamrock Rovers from the slate and focus on the encouraging displays on home, artificial turf and the Candy Stripes must be commended for how they’ve instantly responded and adapted to the move back to Brandywell. Hale tops the goalscoring charts alongside Graham Burke, Kieran Sadlier and Graham Cummings with five goals while Curtis joins up with the Republic of Ireland U21 squad having netted four times for his club so far. With SEVEN youth internationals among the current first team heading off on duty with their respective national teams this week, things are looking a lot brighter for the Foylesiders. It has been two ruthless displays by the home side and the return to the magnificent Lone Moor Road venue has certainly had the desired effect. “I think we needed to get a response for all the fans especially and for ourselves as well but we let everyone down last Friday night,” added McEneff. “I’d like to take the opportunity to apologise to all the travelling fans who watched it. It just wasn’t good enough. To come back home and get six points out of six and play some good football as well.